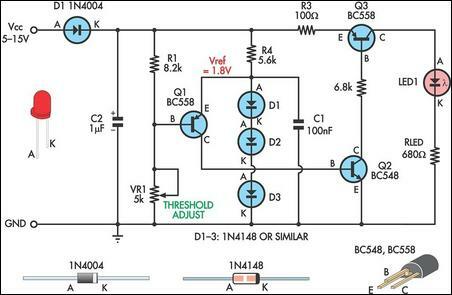 Here's a simple low supply rail detection circuit that costs peanuts and takes just 20 minutes or so to make. Its power consumption is quite low, so it could easily be built into battery-powered devices. Instead of using an op amp, the circuit is built around three low-cost transistors (Q1-Q3). Diodes D1-D3 form a 1.8V voltage reference (Vref) for the emitter of Q1. If the voltage across the voltage divider formed by R1 and VR1 is less than this, Q1 turns on and supplies Q2 with base bias current. This turns on Q3 in proportion to this bias current which then drives LED1. The brightness of the LED gives an indication of the severity of the low voltage condition. The brighter the LED, the lower the supply voltage. Trimpot VR1 is adjusted so that LED1 just comes on at the desired low-voltage point. The current consumption is typically less than 2mA when LED1 is off. Finally, the value shown for RLED is suitable for 6-12V operation. For other voltages, RLED can be calculated using the formula RLED = (Vcc - 1.8)/0.01 (this equates to a current of about 10mA).